Here is a follow-up to our original post on our Masters Experience (you can read HERE). While we were planning our trip, some of these tips would have been helpful, so we thought we would share what we learned in 2014 and hope it helps anyone planning a future trip to this amazing place. National ticket vendors. (Stub-hub, Golden Ticket, etc.) This route is the safest, you know you are not buying a fraudulent ticket, and if it is a fake, you have some recourse for the cash you shelled out (They also take credit cards which was nice.) We used these two mentioned above and both were great. You have to pick up your tickets from their local offices, and sometimes return them to them at the end of the day. There is no will-call at the course. Augusta National has a 2,700-foot city law that does not allow for ticket sales within that zone, although we did see a few transaction inside the area, but very few. Street Vendors. Many vendors are there year after year on Washington Road located on the north side of the course, and the majority have connections to buy and sell tickets. There can be a tiny bit of risk as they may buy a ticket from someone to resell to you, and not know for sure if it is a valid ticket, but fairly safe here again. Craigslist. This is a total hit or miss, and there are a lot of people out there that are fraudulent, and a few that are legitimate. We did post an ad here needing tickets, and were contacted, you just have to get a feel for who you are dealing with and how much confidence you have in that person. This is the place that some stolen or forged tickets trade hands and we did hear of people being denied entry with faked or stolen tickets. (There is a bar code that is scanned for verification by the entrance staff, just like any other event. But, if a member who purchased the original has had the ticket stolen, they can report it to the staff at Augusta, and they can deny entry to that ticket, so be careful.) Our rule here is that if the person will not meet you face to face, then you are taking a huge risk. Or if the price seems to be ridiculously low, it is most likely too good to be true. It is free right across the street, but remember there are a limited number of spaces and those will fill up by 9:00AM or so. If you are later, and lots are closed, there are several smaller pay lots off Washington Road on the north side of the course, expect to pay about $20 or so. Many of these sites are fairly close to Gate #9, the main gate. This gate will bring you into the main practice range, concessions and shopping facility. There are two gates Patrons use, gate 9 and gate 6. Gate 9 is the main gate on the northwestern side of the course, right near the intersection of Washington Road and Berckmans Road. This gate brings you in past the practice area, into the main store for retail shopping, and right out onto the #1 fairway. It can be busy, especially on weekend days, but people are very courteous and mill about getting their business done as they prepare for the days golf. The other entrance is gate 6, on the southwestern corner again off Berckmans Road. (If you are collecting a ticket from Stub Hub, this is the gate you will want to enter through as their pickup house is on Heath Rd right across from the gate.) This gate also has a retail shop, although a bit smaller, and full concessions. You drop down out of the entrance area onto the course via several paths or stairs, onto holes #15 or #14. Easier access to Amen Corner here, and the back nine is more prevalent. We actually preferred this entrance. Right side of #6 green, just to see how sloped it really is. #8 fairway crossing, how uphill and blind is that second shot? Amen Corner, #11 green, and #12 green. #13 Fairway, and Rae’s creek. #15 pond in front of the green, either from fairway crossing or grandstand. #18 crossway looking up fairway just below the tee box. The huge leaderboard on side of #1 fairway, showing all the players names. There are also several different “street sign posts” with arrows pointing towards specific holes on the course. First and foremost, get there early! Thursday and Friday rounds will start at about 7:45-8:00AM, and there are some 100 golfers going out those days. You need to see your favorites, so no sleeping in or playing too hard the night before. Saturday and Sunday rounds will start about 10:00AM, but if you are planning on placing a chair at a specific hole, you better be in line to be on the course no later than 7:30AM. The gates will allow you in prior to that, but the course is not open till 8:00AM, and that is when the mad rush, (remember walking only), will occur for prime viewing locations. Below is a list of our favorites, not to say that there aren’t many other great locations, these are just the ones we really liked. 1. #16 green. This was our favorite and we would go back here again if we return. We chose the seated area just up from the pond, with views back to the tee box on #16, across the lake to #15 green, and over towards #6 green. (Some people chose to sit up on the hillside, above the walkway, we felt it was a bit steep and over a long time might not be all that comfortable, but it does help with elevation for better viewing angles up there.) Many will rush in to get their chairs set up just in front on the pond, but we liked up on the high side against the ropes just in front of the walkway. 2. Amen Corner. Everyone wants to sit here and it will be crowded all day as long as there are golfers coming through. We sat 5 rows up parallel to the tee box, but would have preferred to be directly behind the tee box a bit more for better angles of the tee shots, and the approach shots to #11 green. You have to get there early to get a seat set, or just wander in anytime for standing on the hill directly behind the tee box is good too. 3. #2 fairway. On the lower side of the fairway, you can stand or sit and watch the tee shots come down over the hill for the big hitters. Then there is a great angle to watch the approach shots to the green. 4. #18 green. If you can get a seat in the first 18-20 rows directly behind the green, it will offer great views. If you are on the sides, be sure to think about what your angles are when the area is full of patrons, and you have to peer through the “heads” to the green. Also, when the Patrons do stand, how will your sight line change? 5. #13 fairway. You get a great view of the ball coming off the tee. From there, you can see just how sloped the fairway is and what happens if the players do not hit a perfect drive. Then there is the approach; do they go for it in two, or lay up in front of Rae’s Creek tributary? You can see all the way to the green, but you may need some binoculars. Added bonus is that this area is shaded a lot of the day. 6. If you have time, go down to the #10 fairway right side and see if you can find the place Bubba Watson hit the miracle 90-degree hook out of the trees off the pine straw; you will be even more amazed he pulled that shot off when you stand down there and see it for yourself! Lastly, when you do set up a chair, you can leave it all day and nobody will move it. There is an unwritten rule, and security to enforce it, that your chair is your space and you could be gone elsewhere on the course, to return and have a seat wherever you set it. If you buy the chair from the course, we do recommend it, there is a slot on the back for a business card to signify it is yours. We took it a step further, placing a pink ribbon on the edge of the back, so it was recognizable from the others. We did see a ton of people endlessly searching for their seats after having set them early in the day and not memorizing the exact spot or row they set the chair. You have to get something right? Well you can spend as little or as much as you want, and that is up to you. What we will discuss is the timing. If you are going on a practice round, you can go shopping anytime and do your spending whenever. If it is a tournament round, it is always better early on Thursday and Friday, fewer golfers on the course, less people in the stores. Over the weekend, if you get in early before the golfers tee off, it will be crowded in the shops, but better then than during the play. Later in the day, many times it gets crowded, and later in the tournament some things do start to run out of stock, so if you see something, buy it. Here is the best thing of all; you can ship it home directly from the course, or check it like a coat check and pick it up when you leave, no need to tote it around all day with you, we did this a lot. We actually bought our own chairs ahead of time at a local store, but in hindsight should have just bought the Master’s chair (only $30 and they are much sturdier and a great souvenir). Sunscreen is a must, but it is also sold at the course and very reasonable. In fact, everything is priced very reasonably at the course. Make sure to wear comfy walking shoes, as you’ll do a lot of it; remember that you may be walking some 6-10 miles on uneven ground. Additionally, we opted for golf attire and hats everyday. Bright colors are a good option so you can spot each other while on the course and maybe even on TV! We were fortunate to have great weather, so we didn’t need a lot of layers. Remember, you can always buy what you didn’t bring in! Since cell phones aren’t allowed in, we had to get creative about meeting up with friends since we couldn’t just text each other. There are complimentary phones to use to call people outside the course, but in-person is the only way to communicate with friends inside. Most of the time, our group arrived at different times of the day and we also split up at times to explore in smaller groups. A great meeting spot for us was under the scoreboard behind the #7 green. This was a pretty central spot to meet, not too crowded and you could still watch golf as you waited for your friends to arrive. 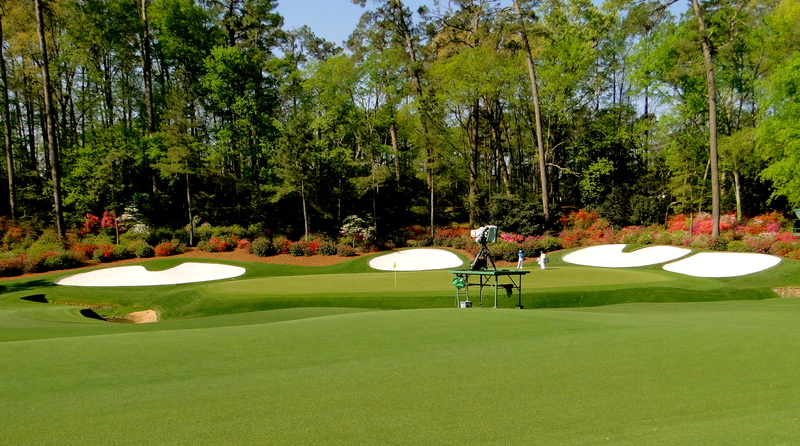 We hope this helps for anyone planning on making a trip to the Masters. For some, as it was for us, this is one of the biggest bucket list in sports you can do, and it can be done by everyone, just a bit pricey. We were fortunate to have been there for the whole week and attended 5 days. We met a mother and son who actually sold us a ticket for the Wed. round who had flown in from Coeur d’Alene, ID to Atlanta on Tues, drove to the course on Wed. for the practice round, and then drove back to Atlanta and flew home on Thursday, bucket list trip for sure! This entry was posted in April 2014 and tagged Augusta National, Bucket List, golf, Tips for Masters on April 25, 2014 by Mike.